A few mornings ago I was just emerging from a good night’s sleep when there was a very loud bang on our bedroom window. Light was just beginning to filter into the room past the edges of our curtains. After this sudden noise there was no hope of dreaming on – or of sleeping in for a while. In my bare feet I padded across to the window and drew the curtains, expecting to see a half-dazed bird on the pavers of the path outside. Nothing. After showering and dressing I went into the garden to investigate. Still nothing. But the bird which had crashed into our window had left two nasty after-effects. Streaked across the glass was a huge mess where the bird had defecated on impact. And the glass pane was neatly cracked – diagonally from one top corner to the opposite bottom corner. We frequently have birds crash into our windows; it probably happens every few weeks. Usually they are just stunned for a few minutes before they fly off, wiser perhaps for the experience. Several times a year – perhaps only once or twice – a bird will be so badly hurt that it is killed on impact. 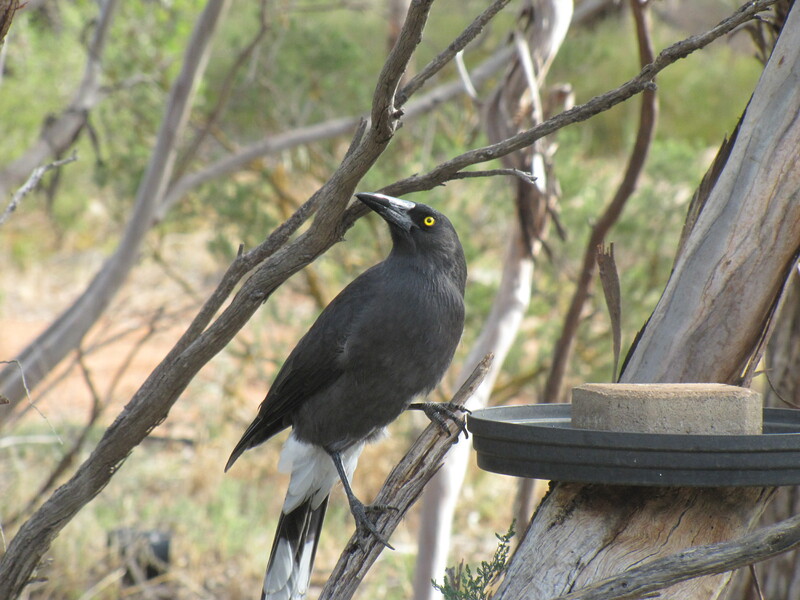 Usually it is the smaller birds such as the pardalotes. Collisions like this happen all over the world. The birds see a reflection of some trees or a park or a garden in the window and they assume that they can fly right on through – until they come to a sudden halt when they hit the glass. There is very little one can do to prevent this unfortunately. On this occasion, however, there remained a puzzle. Which species had caused such a devastating impact on our window – enough to crack it so thoroughly? My first thought was a baby magpie just learning to fly. We have several of them around at present. Then I thought it could have been a Little Raven. Tough critters – but we haven’t seen many of those around recently. This morning I realised that it could have been a Grey Currawong. Several have been hanging around the garden recently and with their enormous beak the impact could have been caused by one of them. Unless they start talking to me, I guess I’ll never know! I wish birds understood glass better! I’ve stopped leaving flowers in vases or pots near windows, because I wondered if sometimes the birds are flying towards the flower or plant. Maybe a large stuffed cat would deter them! 1. Don’t clean the windows; dirty windows reflect less. 2. Hang a cardboard cut-out hawk to deter the smaller birds. 3. Drape shade cloth over the window.